Living with late stage colon cancer after working over 30 years on the business side of big industry. An MBA from St. Mary's Moraga now venturing a 2nd career as a fictional suspense thriller author and guest speaker on the rebuilding of integrity and ethics in business, government, and life. The "Out of" trilogy depicts solutions to terrible injustices. Villains will face unexpected consequences of their own greed. Heros are redeemed by doing the right thing. 10% of Net Book Sale Proceeds will be Donated to UCSF Cancer Research. When Peck O’Brien sets off for the office one morning, he is not prepared for the hailstorm that greets him. Peck O’Brien must apply the perfect salve for the terrible wrong for which he feels he is responsible. With client Scott Quiggly fighting for his life, Peck’s moral sense kicks in and he makes a seemingly ridiculous settlement offer. After announcing a sizable settlement to Quiggly’s family, Peck isn’t finished with his goal for compensation. His personal health-related project will definitely settle his conscience. He just needs support: financial and moral. Unfortunately there are forces, nasty forces, working against Peck’s intentions and plotting to keep him involved. With the loyalty of Nicole, his office assistant, Peck is faced with a difficult, if not frightening, situation. What can he do that doesn’t risk his own life? Out of Air by S. Edward Lawrence is a fast paced, contemporary corporate thriller that deserves to stand on the shelf among the likes of John Grisham. Lawrence encompasses the standards of high quality fiction in this thought provoking tale full of entertaining dialogue and relatable characters. Although the main character attempts to represent admirable moral fiber, the reality of his situation is not lost on readers. The legal world too often attempts to overlook the innocent victims of work ethics in today’s world, while Peck focuses on the moral issues that plague the working class. I recommend this novel for both “beach” read and late evening by fire entertainment. A seemingly coincidental meeting on an airplane flight between Peck O’Brien, President and CEO of Best American Building Products, Inc., and Petra Morgan, was not so coincidental after all. This brief interaction sets the stage for this intriguing and complex novel. There are many other interesting characters, with multiple motivations and entanglements, in this novel. 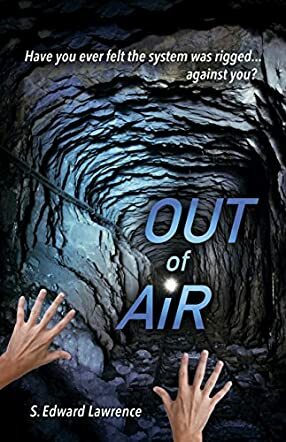 S. Edward Lawrence, author of Out of Air, has developed a plot that engages the reader throughout his fictional story. In the preface, Mr. Lawrence discloses that he worked “twenty-five years in company service in an industry fraught with government regulations and hazmat liabilities.” His knowledge and expertise in dealing with these matters are certainly evident. The involvement of Board members, attorneys, and Peck’s administrative assistant are intricately interwoven into Peck’s main goal of keeping the corporation afloat. His friendships and corporate associations are intermixed, a common feature in the corporate world. Out of Air is an intricate mosaic of many parts functioning together – not unlike the complicated world of large corporations. The author has captured the numerous factions that leaders of companies face. His writing style is succinct, and although there are many characters in the story, it is easy to follow each one, although some have secret identities. Sometimes, it is difficult to unravel who are the “good” guys vs. the “bad” guys – and that is the point of the story. This is both a thought-provoking and an entertaining novel, engaging the reader from beginning to end.